You can define custom fields with Gtmhub that go with every OKR. By default, Gtmhub will store info from the built-in fields Name, Description, Owner and Parent OKR for each Objective & Key Result. However, you can easily add more fields. Note that you can add as many custom fields as you like to your OKRs. There're no limits. 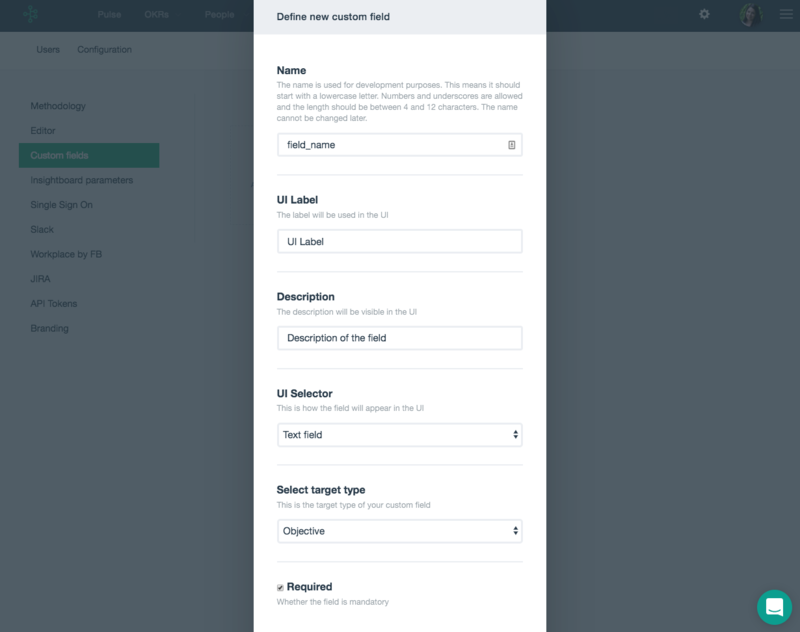 In order to define custom fields and add them to the OKRs, you should have permissions for managing the configuration of Gtmhub. If this is checked, every user must fill in the value of this field when creating an OKR. To make the field optional, leave this unchecked. You can use custom fields the same way you use other fields. If you have defined the field risks, discussed above, this is how it would look like.